'Twas the night before Christmas... when a zombie apocalypse threatened the sleepy town of Little Haven. Waking to discover a new world of chaos and carnage, Anna and her friends must fight, slash and sing their way to survival. In the face of hellish snowmen, an undead Santa and bloodthirsty elves, the gang enter a desperate race to reach their loved ones hiding out at their local high school. The 'Anna and the Apocalypse' competition has now closed. Winners will be announced shortly. Competition opens at 5pm AEDT on Sunday 3rd March 2019 and closes at 11:59pm AEDT on Sunday 10th March 2019. Five winners will be chosen at random on Monday 11th March 2019. To successfully win, entrants must fulfil the above entry conditions before the time the competition closes. Current members/followers are eligible to enter the competition. Only one entry per person. Only one winner per household. To be a valid winner, the entrant must not have won a prize from SWITCH within the last 28 days. 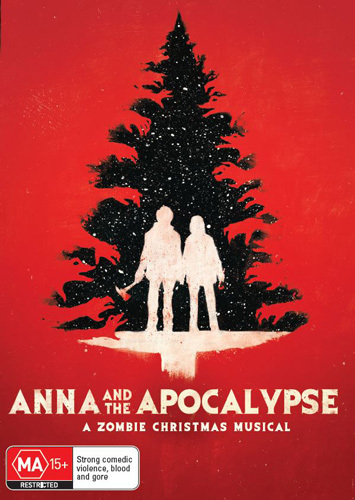 Each winner will receive one DVD copy of 'Anna and the Apocalypse'. By entering, you agree to receive occasional emails from SWITCH in the future. If you decide to unsubscribe from these updates, any further entries will not be applicable. Only Australian residents are eligible to enter. 'Anna and the Apocalypse' is available on Digital and DVD on Wednesday the 6th March 2019 from Icon.